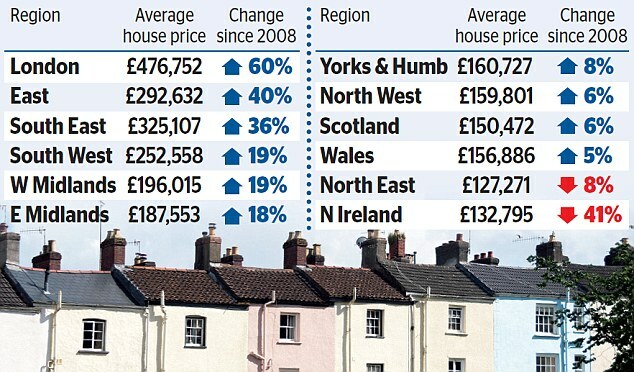 House prices in parts of the UK are lower than they were before the financial crisis a decade ago. In a sign that swathes of the country have failed to bounce back from the credit crunch and recession that followed it, homeowners in the North East and Northern Ireland have seen property values drop by as much as 41 per cent. There has barely been any increase in other parts of the country such as the North West and Scotland as stagnation set in. But the Midlands and the South have bounced back strongly – led by a turbo-charged market in London which has seen the average property rocket 60 per cent in value. The divide, exposed in analysis by investment firm Hargreaves Lansdown and revealed today as part of a Mail series looking back at the crisis, reveals the winners and losers a decade on. Justin Modray, of advice group Candid Money, said: ‘These figures really suggest the country is sharply split. ‘To a large extent, the bubble in housing has been created by the disproportionate amount of wealth that is generated in the City. The crisis triggered a sharp fall in house prices across the country. 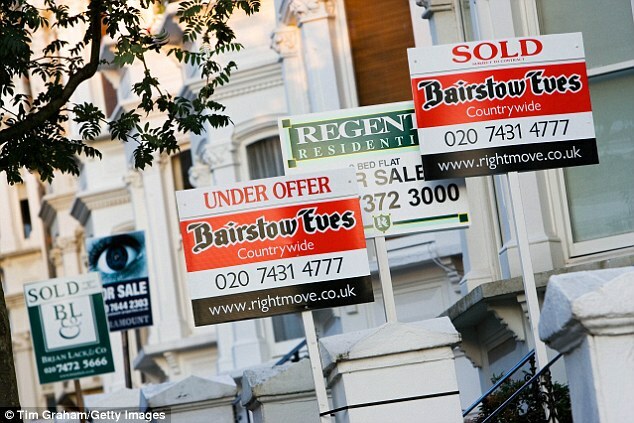 But in London in particular, the market bounced back, and the average home in the capital stands at £476,752. Prices in the East of England are 40 per cent above their pre-crisis peak at £292,632 and those in the South East are up 36 per cent at £325,107. Northern Ireland prices have fallen 41 per cent at the bottom of the pack – down to £132,795 – with the average North East property losing 8 per cent of its value to be worth £127,271. Other regions such as Yorkshire and the Humber, the North West, Scotland and Wales, have stayed almost static with growth between 5 per cent and 8 per cent. A similar stark divide can be seen in wage growth. London and the South East have seen average wage growth of more than 25 per cent each since the collapse of Lehman Brothers in September 2008, with wages standing at £41,340 and £36,920 respectively, according to Office for National Statistics figures. At the other end of the spectrum, wages in the North West are up little more than 12 per cent at £27,924. It again suggests that the highest paid regions of the country have fared the best, with other parts left behind by the recovery. 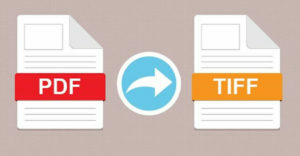 The Bank of England slashed interest rates to record lows after Lehman went bankrupt in a bid to stave off total economic collapse, then flooded the markets with cheap money through an unprecedented programme to buy government bonds. Critics have long argued that this boosted the assets of the wealthy while leaving struggling workers behind as wage growth seized up and ordinary savers’s nest eggs earned terrible returns in bank accounts. More than 3,300 bank branches have been shut since the financial crisis. Barclays, HSBC, Lloyds and Natwest owner Royal Bank of Scotland had around 8,400 branches at the end of 2008, according to analysis by the Mail. But today only about 5,100 are still open after brutal cutbacks. RBS has been the most prolific closer, slashing 1,423 branches or almost two-thirds of its network. The bank only survived due to a £46billion bailout from taxpayers, and is still 62.4 per cent-owned by the state. Lloyds has shut more than 600 branches and split off hundreds of others to form TSB. Big British lenders have also been forced to dole out £71billion in fines for misconduct since the crisis struck. Lloyds has suffered the heaviest penalties with at least £23.4billion in conduct-related costs and write-offs since 2008 – largely due to compensation for victims of the payment protection insurance scandal. RBS is next on the list with costs of £20.6billion.